Over the course of the 6 months from Apr-Oct this year, our GET IN Youth Promoters have participated in a number of training events, equipping them with the knowledge, expertise and confidence required to programme the live events they want to see in their communities. In April they took part in a residential weekend in Argyll, where they were inspired by Rhona NicDhùghaill from the Oban Communities Trust, Duncan MacInnes from SEALL on the Isle of Skye, and George McConnachie from the Isle of Coll. During the weekend, they learned more about what it takes to be a Promoter and what lay in store for the year ahead. The following month, they visited Strathpeffer Pavilion, where workshops on budget management, fundraising, and sponsorship were held. Yvonne Potter, Promoter at the Pavilion, gave the Youth Promoters an insight into how they cost their events, and how their new Pay What You Decide (PWYD) scheme would work. That evening they had the opportunity to assist venue staff in delivering the first PWYD event – Pip Utton’s Playing Maggie. Pip also took part in a Q&A session earlier in the day with the Youth Promoters. In July, the Youth Promoters met in Glasgow, where they took part in a session on the Critical Response Process with Jaine Lumsden from Creative Scotland, before attending a work-in-progress showing of Company of Wolves‘ new show The End of Things at the Centre for Contemporary Arts, and participated in a post-show discussion – putting in to practise what they had learned that afternoon. The following day, they visited The Whisky Bond where Ashley Smith Hammond, of Culture Republic, gave us presentation on Audience Research and Development – what tools to use and where to find relevant data. With Edinburgh the place to be for most Promoters and Performers in August, the next training sessions took place in the Festival City with a theme of Programming; Inclusion & Diversity. At Out of the Blue Drill Hall, Neil Butler of UZ Arts inspired the Youth Promoters with tales of his journey from student promoter in Brighton Folk Club to international producer of major outdoor events. The following day, Helen Trew of the Creative Scotland Equalities and Diversity team led an interactive session stretching the Youth Promoter’s perception of inclusion, and encouraging holistic thoughts on programming for their local communities, both in geographic terms and communities of interest. Fiona MacLennan from Creative Carbon Scotland also joined the Youth Promoters and helped them think about the impact of rural touring on the environment. This led the Youth Promoters to begin plotting the most efficient route for their tour on the map. 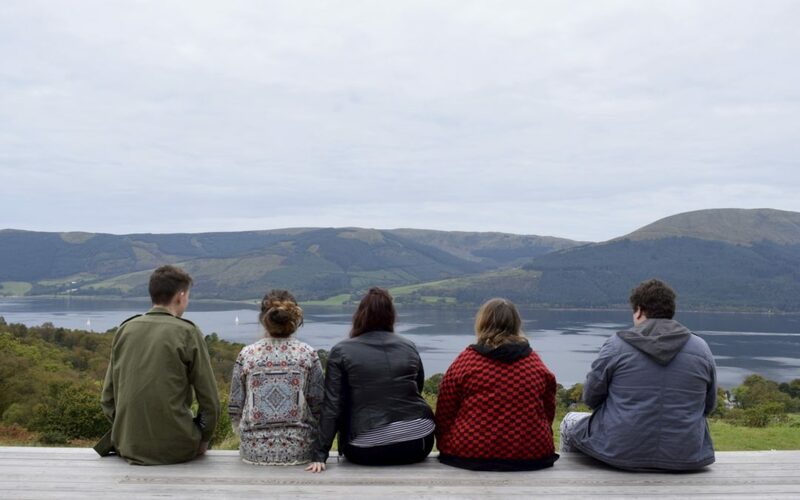 In early Oct, the Youth Promoters then gathered together at the fantastic Cove Park near Helensburgh, where they shortlisted their tour ideas, and started putting everything they have learned into practice. They were joined by Alex McQuiston of Absolute Classics, who shared his experience of gaining sponsorship for arts events. Since then they have been busy negotiating with their programming choices, and scheduling the GET IN Tour. Stay tuned for an announcement very soon! If you would like to take part in GET IN in 2017-18, find out more and apply here: GET IN 2017/18.